“Tennis Elbow” or Lateral Epicondylitis causes pain over the outside of the elbow. Studies have shown that up to 50% of recreational “for fun” tennis players will develop symptoms at some stage[1, 2]. The condition occurs less in professional players, presumably due to better technique and equipment. It usually affects both men and women between 30 and 50 years of age . And, contrary to its name, the condition is linked to playing tennis in less than 5% of cases. Lateral epicondylitis is essentially a repetitive stress or overuse injury. It can occur with any activity where there is repetitive extension and/or twisting of the wrist[3,4]. The condition is caused by degeneration or tears of the tendons attaching to the bone on the outside of the elbow (lateral epicondyle). The Extensor Carpi Radialis (ECRB) tendon is most commonly affected. 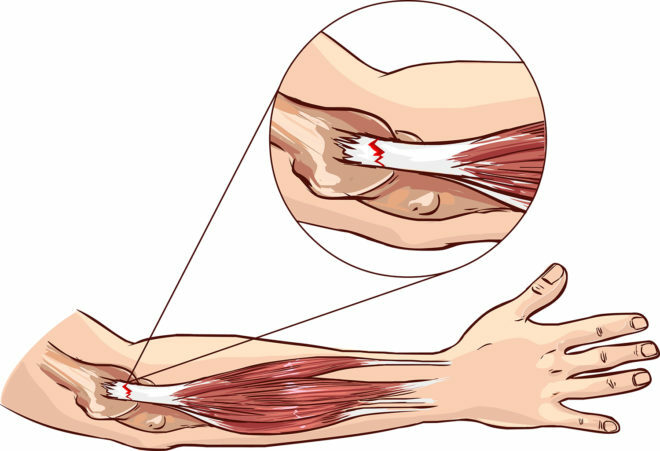 This tendon is involved in extending the wrist joint and is active while gripping with the wrist extended – such as when holding a tennis racquet. Other activities such as prolonged use of a computer mouse and typing at a keyboard have been implicated. Plumbers, painters, carpenters, butchers and chefs are groups at risk due to their wrist motion in their line of work. In tennis players, the backhand stroke causes injury by overloading the wrist extensor muscles attaching into the lateral epicondyle. This stroke can be performed using a one-handed or two-handed technique, however, the one -handed approach is more commonly associated with elbow injury. Incorrect grip size of racket handle has been found to cause increased force transmission to the elbow increasing injury risk. Also reports are emerging that decreasing grip strength and relaxing forearm muscles in the follow-through phase of the back- hand stroke can help prevent “Tennis Elbow” in recreational tennis players[3,5,6]. Other conditions can cause symptoms that mimic tennis elbow and need to be ruled out. These include arthritis of the elbow, ligament injuries, neck problems, nerve entrapment, and shoulder impingement. History and clinical examination usually guides your doctor to the diagnosis. Further imaging such as an MRI scan may help identify the severity of the condition, and any underlying pathology. There is no consensus on the definitive treatment of lateral epicondylitis. However a period of non-operative treatment is recommended before considering surgery. Most cases are self-limiting and resolve with rest within 6 to 12 months. However, for some, especially the keen tennis player, this wait-and-see approach may not be feasible. Conservative treatment may involve a combination of eccentric stretching exercises with physiotherapy, bracing and injections[8, 9]. With a failed trial of non-operative treatment, surgical release and/or repair of the tendons at the lateral epicondyle can be performed. Studies of functional recovery after surgery have indicated that patients can typically return to play within 3 to 6 months . Prevention programmes focused on warm-up stretches, and equipment modifications such as racquet grip sizing are important in the long term management of the condition. 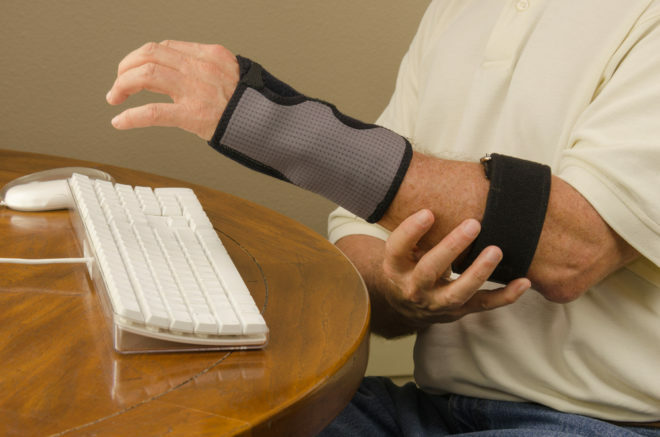 Lifestyle changes may be required in those who have an occupational risk of the condition such as rest periods, equipment adaptation and avoidance of repetitive wrist extension. 1. Pluim BM, Staal JB, Windler GE, et al. Tennis injuries: occurrence, aetiology, and prevention. Br J Sports Med 2006;40(5):415–23. 2. Nirschl RP. Elbow tendinosis/tennis elbow. Clin Sports Med 1992;11(4):851–70. 3. Chung KC, Lark, ME. 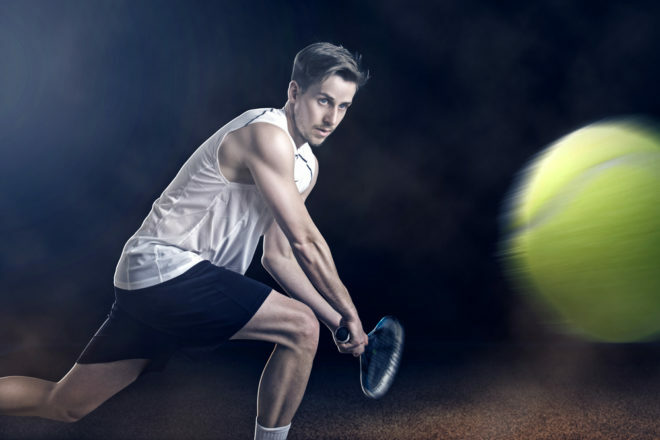 Upper Extremity Injuries in Tennis Players: Diagnosis, Treatment, and Management. Hand Clin 2017;33: 175–186. 4. Nirschl RP, Ashman ES. Elbow tendinopathy: tennis elbow. Clin Sports Med 2003;22(4):813–36. 5. Riek S, Chapman AE, Milner T. A simulation of muscle force and internal kinematics of extensor carpi radialis brevis during backhand tennis stroke: implications for injury. Clin Biomech (Bristol, Avon) 1999; 14(7):477–83. 6. Rossi J, Vigouroux L, Barla C, et al. Potential effects of racket grip size on lateral epicondilalgy risks. Scand J Med Sci Sports 2014;24(6):e462–470. 7. van Kollenburg JA, Brouwer KM, Jupiter JB, et al. Magnetic resonance imaging signal abnormalities in enthesopathy of the extensor carpi radialis longus origin. J Hand Surg Am 2009;34(6):1094–8. 8. Krogh TP, Fredberg U, Stengaard-Pedersen K, et al. Treatment of lateral epicondylitis with platelet-rich plasma, glucocorticoid, or saline: a randomized, double-blind, placebo-controlled trial. Am J Sports Med 2013;41(3):625–35. 9. Gautam VK, Verma S, Batra S, et al. Platelet-rich plasma versus corticosteroid injection for recalci-trant lateral epicondylitis: clinical and ultrasonographic evaluation. J Orthop Surg (Hong Kong) 2015;23(1):1–5. 10. Solheim E, Hegna J, Oyen J. Arthroscopic versus open tennis elbow release: 3- to 6-year results of a case-control series of 305 elbows. Arthroscopy 2013;29(5):854–9. 11. Oki G, Iba K, Sasaki K, et al. Time to functional recovery after arthroscopic surgery for tennis elbow. J Shoulder Elbow Surg 2014;23(10):1527–31.